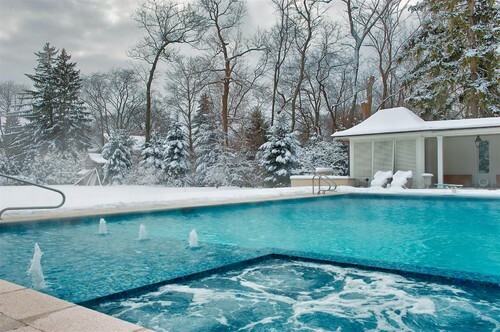 When it comes to in-ground pool maintenance, one of the most important tasks on the list for those who live in climates where temperatures fall below freezing in the winter is to fully winterize the pool. Winterizing your pool will help prevent damage to system components from freezing and expanding water. For simple best practices, follow the outline we provide below, it takes less time than you’d think. When temperatures start dropping and leaves start falling, it’s time to take action. The way weather can change abruptly in some places, you may be removing accumulations of snow from your pool cover before you know it! Follow these steps to ensure that you don’t get any costly surprises when you open your pool in the spring. Note that there is also a set of steps below to take if you live in a milder climate but will be using your pool less over the winter. Adjust pool pH to 7.2-7.8. This will prevent staining, scaling, and algae growth. Shock the pool following product directions. Run the filter for 24-48 hours depending on how dirty the water is. Skim out floating debris and vacuum the pool thoroughly. Add an algaecide to prevent algae from forming before the water has frozen. Follow your pool manufacturer's directions for lowering your water level. 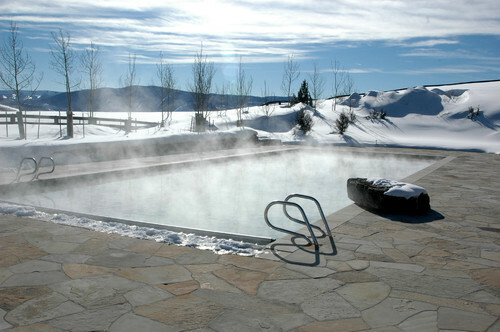 Only a few type of pools need to be completely drained during the winter. Many pools tolerate cold temperatures better when partially filled with water as a buffer. A completely empty pool can also crack or pop out of the ground because of pressure from ground water. If an automatic cover is being used, be sure to follow the manufacturer’s instructions regarding water level. Some will recommend that after blowing out the plumbing lines you plug the skimmer and returns, and raise the water level to a point that it will support the cover when it is weighted down by snow. Turn off the filter pump and drain the pump, filter heater, and other equipment. Store equipment to prevent freezing. Follow manufacturer's directions for lubrication and proper covering. Turn off all power to the support equipment and remove fuses or turn the circuit breakers to off. If you have a slide or diving board, take it off and store it. Cover the pool securely with a solid or mesh safety cover, or an automatic cover. Be sure that the edge of the cover is sealed so that wind does not get under it. A good pool cover resists water, weather, and pool chemicals and keeps out leaves and other debris. If you live in a mild climate, you will have a longer pool season. 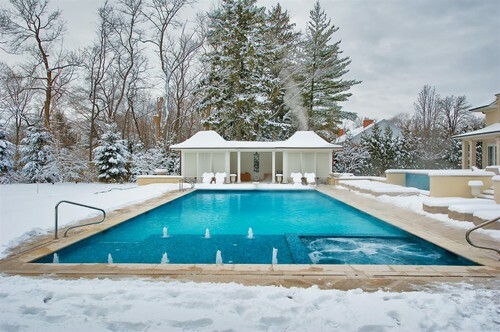 However, there may be periods where you use your pool very infrequently as it is not uncommon to see temperatures drop below freezing from time to time even in warmer areas. While you might not need to truly winterize your pool, you can cut back on the maintenance by following the four easy steps below. Make sure to check your freeze protection. It can often be a manual dial or built into your pool pump or pool automation. As the temperature begins to drop, ensuring your freeze protection is working will prevent any cracked or damaged equipment. Cut your filter running time in half and reduce the amount of run time on the pump. If possible, set the run time to be during the evening when it is coldest so that when your freeze protection activates, it is also counting toward the amount of time needed to filter the pool. This results in a little cost savings that can add up if done properly. Keep pool pH between 7.2-7.8 and test regularly to keep free available chlorine between 1.0 and 3.0 parts per million. Follow the manufacturer's instructions for proper care and maintenance of your pool equipment even during this time of reduced use. Consider winterizing additional pool features you may have such as slides and other accessories to prevent any damage. Unless you cover your pool, clean the skimmer weekly, maintain the filter according to the manufacturer's instructions, and vacuum as needed. Covering your pool will keep out debris and reduce the need for chlorine. Before covering it, shock treat the water according to the chemical manufacturer's directions. Staying on top of pool maintenance throughout swim season and then properly winterizing your pool as the weather starts to turn can save you a tremendous amount of time, money, and frustration over the lifetime of your backyard swimming pool. And you’ll find that as you get into a rhythm, the tasks become second nature. 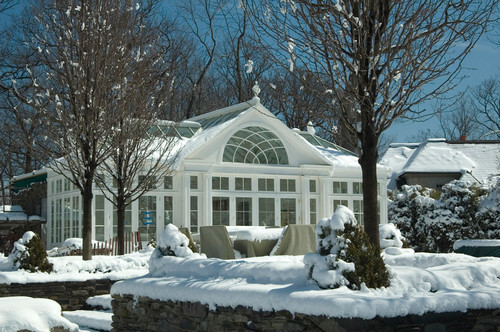 If winterization tasks seem a little too daunting, it is never a bad idea to call your trusted pool builder to provide these services for you. This will ensure the job is done properly to help keep your pool in the best condition possible for the next season. Whether you’re swimming in it or eagerly awaiting the return of warm weather, your pool is a great source of excitement year-round, so be sure to protect your investment! Lance started his career in banking and finance in NYC. Persuaded by his father at the chance for early retirement and infinite glory, Lance took the leap of faith to follow in his Father’s footsteps and continue the legacy as a second generation pool builder. With over 700 pools in ground, Lance would like to think he knows a little bit about what he does, but in his free time he likes to talk about fast cars, good food and ways to grow and improve his business.